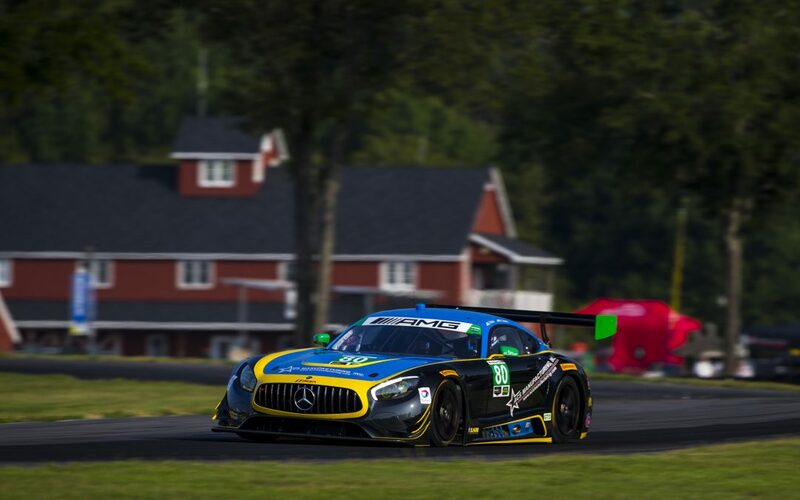 DANVILLE, Virginia (August 29, 2017) – Dan Knox, Mike Skeen and Lone Star Racing persevered to the checkered flag in a tough Michelin GT Challenge at VIRginia International Raceway (VIR) on Sunday to score a hard-earned 11th place GT Daytona (GTD) class IMSA WeatherTech SportsCar Championship race finish. Knox, Skeen and the Lone Star Racing team overcame two pit stop penalties and a broken front wheel in the two-hour and 40-minute race. The setbacks put the No. 80 team several laps down, taking away any chance at challenging for a higher finish even though the Lone Star entry had the pace to race in the top five. Skeen turned the fastest race lap of the three competing Mercedes-AMG GT3 entries in the final 30 minutes of the race. Lone Star Racing Team Manager AJ Petersen is already looking ahead to the team’s next scheduled race at Laguna Seca Raceway in September. Next up for Lone Star Racing and the IMSA WeatherTech SportsCar Championship is the Continental Tire Monterey Grand Prix at Laguna Seca Raceway, September 22 – 24. The race can be seen live on FOX Sports 1 (FS1) at 5 p.m. EDT on Sunday, September 24. – Knox and Lone Star Racing’s No. 80 ACS Manufacturing Mercdes-AMG GT3 will both appear at the Park Place Luxury & Supercar Showcase at the Four Seasons Resort and Club Dallas at Las Colinas, in Irving, Texas, on Saturday, September 9. Presented by the Park Place Dealerships, the event showcases both street luxury and high-performance vehicles from the world’s top manufacturers. Lone Star’s race car will be among those representing the Mercedes-AMG brand. About Lone Star Racing: Based at Motorsport Ranch within the greater Dallas-Fort Worth area in Cresson, Texas, Lone Star Racing competed the last three seasons in the No. 80 ACS Manufacturing Dodge Viper GT3-R. For 2017, the team will race an all-new Mercedes-AMG GT3 in a four-race IMSA WeatherTech SportsCar Championship campaign. Lone Star Racing and its team members have won races across North America spanning sprint and endurance racing formats. The crew has worked together on many different teams and various types of cars, developing a strong bond and proven capability that gives them a competitive and winning advantage. The team races with the support of primary partner ACS Manufacturing, Inc. (www.acsmanufacturing.com). Look for Lone Star Racing and Dan Knox on Facebook and follow the team at www.LoneStarRacingTeam.com, @LSRTeam on Twitter and Instagram and on YouTube at Lone Star Racing.